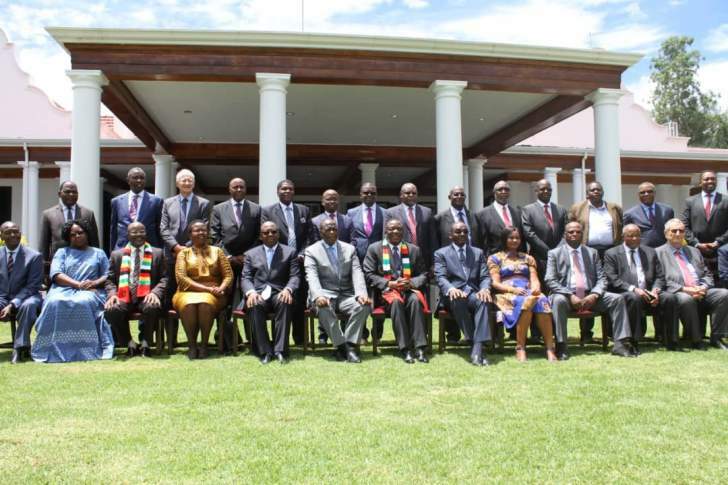 President Mnangagwa yesterday held his inaugural meeting with members of the Presidential Advisory Council (PAC) and exhorted them to quickly give impetus to the Transitional Stabilisation Programme (TSP) by proffering advice and assisting in the formulation of key economic strategies that advance Vision 2030. The Head of State and Government said to propel development and improve people's livelihoods, the PAC members should expend more energy towards supporting the TSP and policy pronouncements made under the Second Republic. TSP is the Government economic blue print covering the period 2018 to 2020. "The Transitional Stabilisation Programme and the various policy pronouncement made under the Second Republic should be a beacon through which we must unleash our full potential towards the attainment of Vision 2030," President Mnangagwa said. "We must therefore proffer our views, recommendations and solutions alive to the interests of the majority. Let us give due regard to the undeniable need to uplift the quality of life of the millions of our people throughout the country. "As the Presidential Advisory Council your work programme should be informed by the immense opportunities in every sector in our nation and the various strategies we need to grow and develop our economy. The present challenges must never obscure or limit what we can become or what we should do, now and in the future. I challenge you to be informed by the hope of a better and more prosperous tomorrow." The advisory council comprises experts and leaders drawn from diverse sectors such as business, health and social protection, agriculture, governance and human rights, faith-based organisations, tourism, education, minorities, ICT, civic society, communication and media management. All its 26 members attended yesterday's meeting at State House save for three who were away on business. Vice Presidents Constantino Chiwenga and Kembo Mohadi, Cabinet Ministers and senior Government officials were also part of the proceedings. President Mnangagwa said the "Zimbabwe we want" will only be built through collective, patriotic approach and singleness of purpose. "That is the reason we gather today, with the overriding objective of working together towards attainment of an ambitious and yet achievable shared vision of becoming a middle income by 2030," he said. "Furthermore, we realise that nations, the world over, have to operate within a more interconnected and complex policy environment. This has given rise to the need for a greater involvement of private sector players in the governance and policy discourse. It is against this background that I saw it fit to constitute a Presidential Advisory Council. You are a team of experts and leaders from across a broad spectrum of professional skills to proffer strategic advice, guidance, information and recommendations on policies that support key goals under Vision 2030." President Mnangagwa said Zimbabwe continued to suffer from the deleterious effects of illegal sanctions imposed by the West hence the need to leapfrog development, modernisation and industrialisation of every facet of its economy to catch up with other countries. "Going forward there is also need for us to harness our potential in the various spheres of the economy through leveraging on our geo-strategic location to attract investment and facilitate trade across the region," he said. "To this end, we are convinced that the rapid development and transformation strategies for economic development adopted by my administration will yield desired successes. Meanwhile, the engagement and re-engagement policy, stabilisation of the macro-economic environment, zero tolerance to corruption, observance of rule of law and entrenchment of democratic values as well as the implementation of devolution and decentralisation of economic activity to provinces and local authorities for social equity should result in the marked improvement of the socio-economic landscape of our country. "Let us build on this broad foundation and give impetus and momentum towards full economic recovery, development and prosperity for all our people." President Mnangagwa said interaction between him, Government officials and PAC members should be flexible and responsive while hinged on patriotism, trust, candidness and confidentiality. "Allow me to assure you that members of my administration, at every level, will be receptive to your ideas, which must be informed and guided by national interests all the time," he said. "A collective approach implies collective responsibility with regards agreed and adopted position. This is a fundamental principle. We must therefore seek to proffer strategies on how to develop, modernise and industrialise every part of our country, improve our infrastructure, speed up the development of rural industry systems as well as increase our overall productivity and exports to effectively enter and participate in the global value chains. Let us harness our collective capacities to create conditions where peace, unity and development can flourish in our country. Guided by our mantra "Zimbabwe is Open for Business" our actions should never lag behind global developments and expectations. Together let us sharpen our focus and make solid footsteps as we define and walk the road towards delivering the Zimbabwe we want." The PAC members, whose contribution is voluntary, will hold office for the duration of the President's tenure of office.